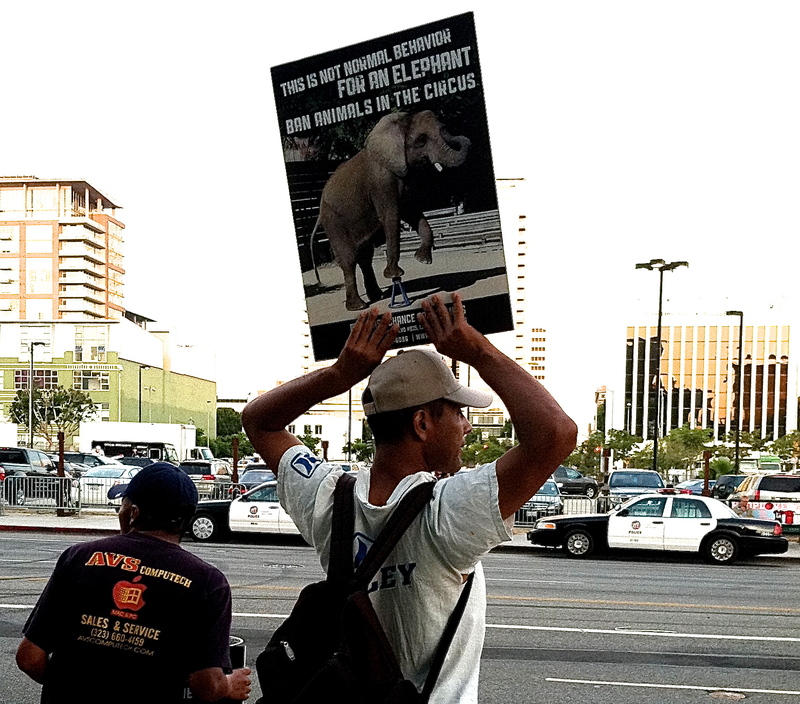 For the last three years I have been attending the Ringling Brothers protest at The Staples Center in Downtown Los Angeles. 2009’s protest was my first ever. 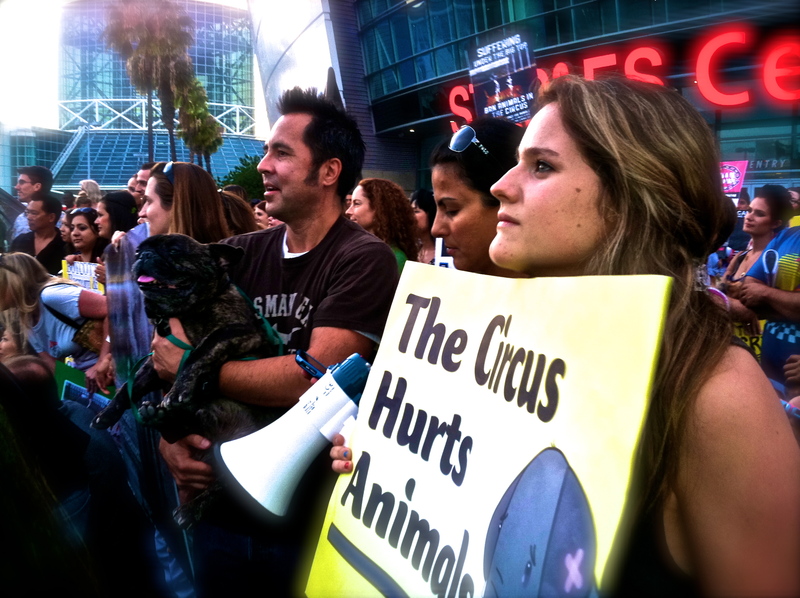 Last year was the first protest at which I actually summoned my voice and spoke with the circus patrons about the truth of Ringling Bros.’ treatment of its animals. 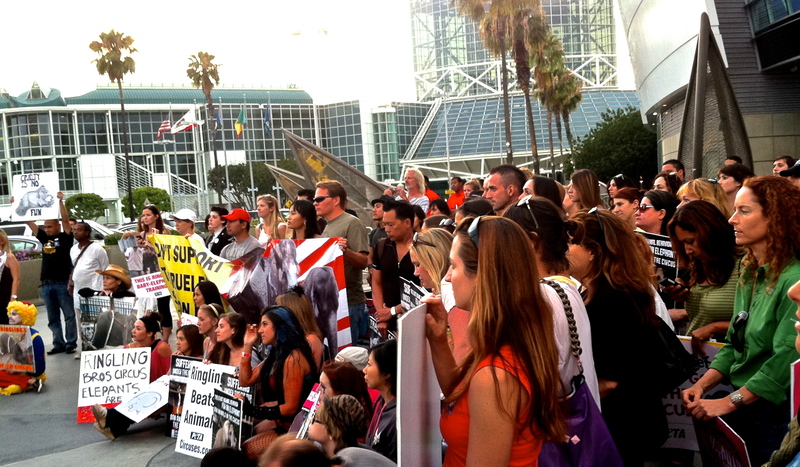 This year, I was quieter yet more confident in my right (even my duty) to be there for the animals. Here are some pictures from this year’s protest. Opening night of the circus, 2011. Opening night of 2012 circus. Tail end of the protest. My favorite. Young protester taking the cause seriously. 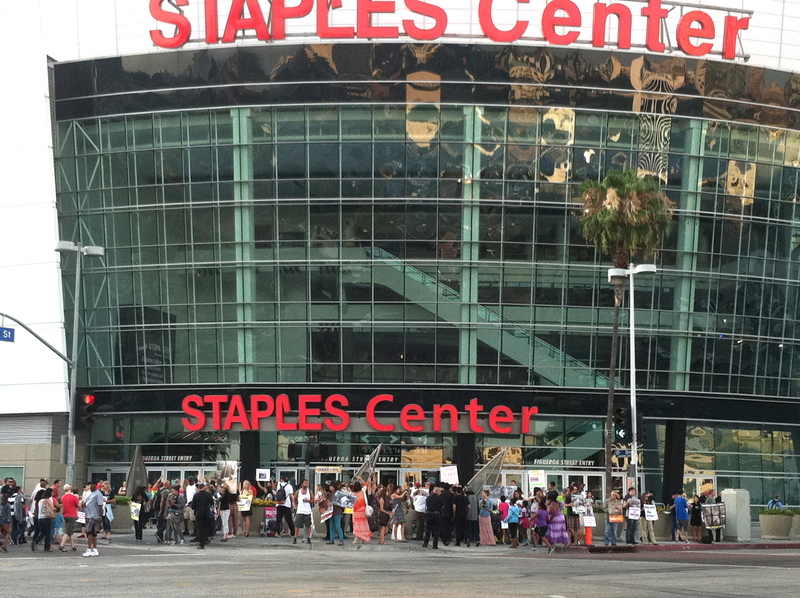 Protestors gathering for the group photo. Ringling Brothers owners and managers, please please please discontinue the use of animals in your circuses, and make it a human-only event. The animals are treated so poorly, I have read in former workers’ testimonials, and I have seen in hidden camera witnessing. A zoo is bad enough and sad enough, but I would rather children and interested adults see animals there than in one of your shows, where I know that behind the scenes, the animals are lashed with whips, prodded with bullhooks and stunned with electric shocks to perform for 5 minutes in “entertainment” for us human beings. It saddens me to know that your elephants are free to roam only an hour of any day, if that, left in ropes and chains, to slowly lose their minds, and then surprisingly are put out to refuge because they’re “no good” to you anymore. It saddens me to know that baby elephants are taken screaming from their screaming mothers, lashed and roped and “hog-tied” and expected immediately to learn how to do your tricks. PLEASE PLEASE PLEASE Ringling Brothers ~ let the animals live free, and use only human performers who can make a choice and make their own decisions, under the big tent. ~~~S Wave~~~, thank you for physically being present at the protest. You represent for those of us who can’t. Thank you, heyata ina. It was very courageous for you to write those words and your points are so well stated. I know that the comments are deleted quickly…no surprise. But perhaps your words made an impact on someone while they were up. That is the hope! Am doing the reblog thing on Mindful Consumption, the mad consumers’ liberation front. Another hero hits the streets in protest against cruelty to animal. Thanks for your efforts. Shocking elephants…terrible. Frankly, I’m kind of surprised that circuses are still around. My wife is an animal crusader as well; she’ll be pleased to see this post!